With the launch of NASCAR ’14 set for Feb. 18, NASCAR Gaming has released a number of images showing the 2014 paint schemes for drivers featured in the game. The first rendering released was 2012 NASCAR Sprint Cup Series champion Brad Keselowski. Since NASCAR ’14 is rated "Everyone," Keselowski’s No. 2 Ford features the words "Blue Duece" on the hood. Not only will the famous No. 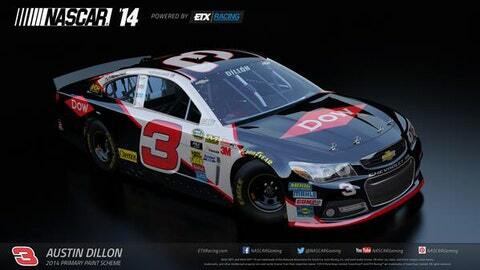 3 make its return to the Sprint Cup Series in 2014, it will also be a popular choice for players. Kyle Busch typically drives like he’s in a video game while on the track, so you can imagine his No. 18 M&M’s Toyota will be pretty fast as well. Players could also take a turn behind the wheel of Kurt Busch’s new ride at Stewart-Haas Racing. Just remember, the game is rated "Everyone." Looking to play as an underdog driver? Look no further than Michael McDowell, Michael Annett and Josh Wise. The Sprint Cup Series drivers don’t get to have all the fun, however. NASCAR Gaming has also released the images of the Nationwide Series cars belonging to Ryan Reed, Chase Elliott and Darrell Wallace Jr.
NASCAR ’14 will be available on Xbox 360, PlayStation 3, and on Steam starting Feb. 18.